Grilled Chicken Breasts, Red Pepper Sauce, Thyme for Cooking. 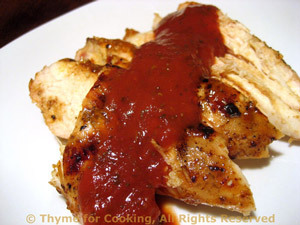 Marinated, grilled chicken breasts with a drizzle of Pimiento Sauce..... Simple and delicious take on barbecue sauce. You can warm it slightly if you like.... I didn't. In small bowl whisk together Worcestershire, vinegar, ketchup, oil, garlic and oregano for marinade. Put chicken breasts in glass baking dish and pour marinade over. Let marinate for 15 - 20 minutes or up to 2 hours. Cook on barbecue grill for 8 - 12 minutes a side or until done (test - take a peak). OR sauté in nonstick skillet for 8 - 10 minutes a side until nicely browned and done. Put all ingredients for the sauce in a blender and purée. Add Tabasco if you like it hot. When chicken is done, remove and slice into 1/2" (1.25cm) slices. Arrange on small platter, drizzle with Pimiento Sauce and serve.